TWO Youth Workers from Ceredigion Youth Service have been selected to represent the UK on a week’s training opportunity in Horažd’ovice in the Czech Republic. 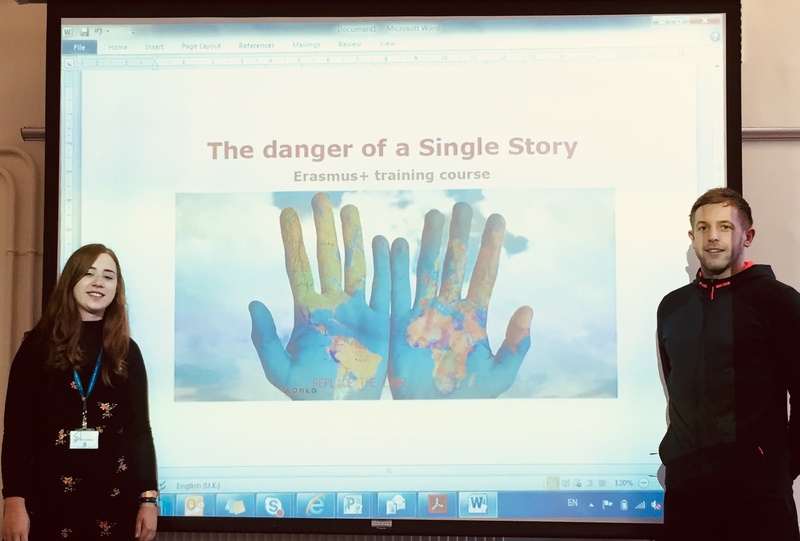 ‘The danger of a Single Story’ is a training course funded by Erasmus+, that combines stories, media, global education and active citizenship to empower trainers, educators and youth workers with the tools to educate young people on issues such as cyberbullying, hate speech, and online harassment. Elen James, Head of Youth Engagement and Continuing Education​,​ said​:​ “We are extremely proud of both Rebeca Davies and Guto Crompton, 270 people had applied, for 24 places, 2 were allocated for the UK and both places have been assigned to Ceredigion Youth Service staff. Rebeca Davies and Guto Crompton will join 22 other Youth Workers from Cyprus, Czech Republic, Greece, Ireland, Italy, Poland, Portugal, Romania, Slovenia, Spain and Turkey. The week will be hosted at the PROUD Environmental Centre approximately 120km from Prague, from ​Sunday (Nov 19) for a week.